There is nothing better than summer in Minneapolis! We have long winters that are delightful until you are going on 7 months in the frigid cold. We have a short spring and then BAM, it’s 80º and people are walking around in their swimsuits. You will find Team Fit Foodie walking around the lakes, canoeing in the boundary waters, and grilling. LOTS of grilling. We have been looking back at older Fit Foodie recipes and revamping them. 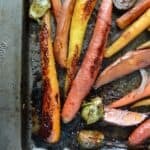 We were all itching for summer so we made a list of a few Fit Foodie recipes on the grill that needed a facelift. These balsamic brussel sprouts were the first on our list! This recipe has been solid from the beginning. At one time it was one of the most popular recipes on FFF. Crazy, right? Guess what? We still LOVE brussel sprouts and we barely changed the recipe. Let’s chat all things BRUSSEL SPROUTS for a minute. We are not talking about frozen brussel sprouts, here. I know many people that hate brussel sprouts because they grew up on frozen brussel sprouts. If you’re into the frozen brussel sprouts thing, more power to you. However, those things are mushier than wet leaves on a crisp fall day after it’s rained. Do you feel me? 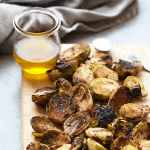 If you are someone who grew up on frozen brussel sprouts, take the time to give these grilled balsamic brussel sprouts a try! 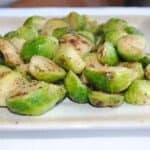 I love tossing brussel sprouts with a little bit of olive oil so they crisp up and a little bit of balsamic vinegar so they caramelize. It is a heavenly combination. Cook them longer than you think! The inside takes longer and the crispier the better on the outside! 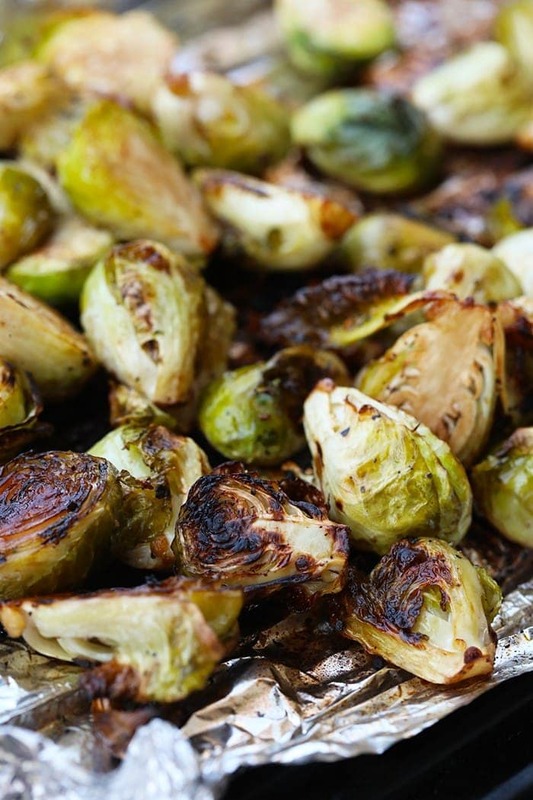 We prefer roasted brussel sprouts and grilled brussel sprouts over steamed brussel sprouts. First, preheat grill to 450ºF and create a tin foil boat out of tinfoil and place on a baking sheet. Next, prepare brussels sprouts by washing and patting dry. Then, using a sharp knife, slice each brussel sprout in half the long way. Place brussels sprouts in the tin foil boat and the rest of the ingredients. Use your hands or a spatula to coat all of the brussels in oil, vinegar, and spices. Place tin foil boat on the grill for 10 minutes. Toss brussels and grill for another 10-20 more minutes.